Do you need help with your novel? Are you looking for an editor? Low rates, high results. Free initial consultation. $10.00 per 1000 words ($2.50 per page—figuring 250-word pages) for a simple manuscript read-through with separate comments. $15.00 per 1000 words ($3.75 per page—figuring 250-word pages) for a complete line-edit for grammar, spelling and punctuation with separate overall comments on the story content. $18.00 to $24.00 per 1000 words ($4.00 to $6.00 per page—figuring 250-word pages) for a complete line-edit for grammar, spelling and punctuation, as well as story content (i.e., characters, plot, dialogue, POV, psychic distance, imagery, etc.). This varies according to the writer’s skill and the editing work required. I’ll need a three- to five-page sample to give a firm bid. As a rule-of-thumb, expect $18.00 per 1000 words ($4.50 or more per 250-word pages). $50 for basic formatting of a manuscript for eBook and/or $60 for POD (print through CreateSpace). This does not include placing images or working with bulleted, specially indented or special text, including drop caps (I’ll need to see your manuscript to bid on these things). $60 for phone consultation while uploading. I’ll help you get your own account on Kindle Direct Publishing, CreateSpace, Barnes and Noble Nook’s Nook Press (formerly PubIt! 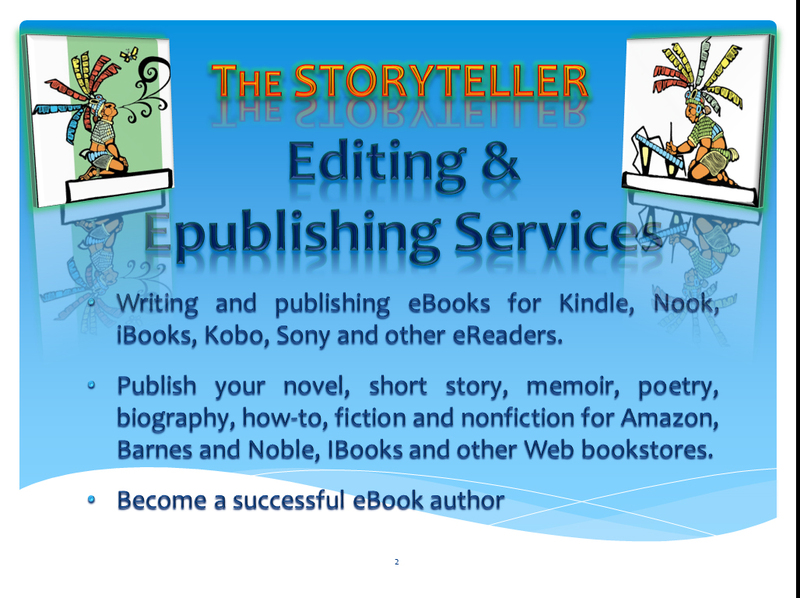 ), Smashwords, etc., and I’ll help you by phone to upload your book. This charge is for the first hour–which generally will get you set up with an account and a book uploaded. I must charge $50 per hour after that, a minimum of $30 for partial hours. $2.00 per image for placement into the formatted eBook or POD print book version ($30.00 minimum). $25 for an “active” table of contents linking to the different sections of the eBook. $25 for a standard table of contents for a POD print book version. $25 ea. for cover conversion and modification (if needed for a complete, author-supplied cover). $175-$225 for a complete eBook AND POD print cover design for the book front cover (and eBook cover), spine and back cover, depending on author-supplied blurbs, images, etc. $75 to $120 for a complete eBook cover design, dependent on whether or not images are supplied and the cover’s complexity. $125-$175 for a complete POD print cover design for the book front cover, spine and back cover, depending on author-supplied blurbs, images, etc. $100 for cover conversion from eBook to POD print, adding the book cover spine and back cover with author-supplied blurbs, images, etc. $50 for cover conversion from POD print to eBook.